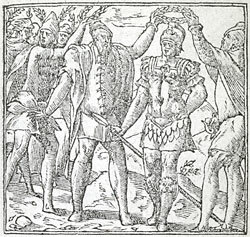 Alciato at Glasgow: Emblem: Les nobles, dancienne race. Section: HONNEUR. View all emblems in this section. A boucles d’or joinctes, & à cigales. Pour demonstrer que du lieu nez estoient. giers, créuz, & tousjours croissans, au mesme lieu de leur origine. 1. In the 1549 French edition, this emblem has no woodcut. 2. ‘in Arcadian fashion’. The Arcadians wore crescent-shaped ornaments because they believed themselves to be the first men on earth and older than the moon. See Ovid, Fastii, 2.290. Evander, who came from Arcadia, was the founder of the primitive settlement on the Palatine hill which preceded Romulus’ Rome. See Vergil, Aeneid, 8.; Plutarch, Quaestiones Romanae,76. 3. i.e. members of the inner circle of noble Roman families claiming descent from the first senators (patres), one hundred in number, appointed by Romulus, founder and first ruler of Rome. These patrician families wore a distinctive black boot with a crescent-shaped ornament. Those members who achieved high political office wore similar red boots, calcei mullei, so called because their colour was like that of a mullet (according to Isidore, Etymologiae (Origines), 19.34.4 and 10).